I don’t know how Sarah Palin could have so easily walked into the infamous, Fast-Talking, Philly Cheesesteak Shop Scam. A total tourist move. Peggy Hill’s usually on the other side of that “gotcha!” moment. Okay, now we know what Sarah’s going to say on the debate Thursday about Pakistan. I’ll be curious to see how exact the statements are. And I notice that Sarah’s back wearing power red, the mullet hair is gone, and she’s in <gulp> PANTS! Major focus-group shift on that one. And then McCain evokes Britney Spears when talking about HW Bush’s overconfidence. Oops. Well at least he didn’t get all Beach Boys on us and start singing about bombing Iran. Because that would, like, be naively announcing you were going to attack someone. Right? It’s Five Days to St. Louis and the Vice-Presidential debate. There isn’t much time for our girl Sarah Palin to cram. And barring a moose eating her homework or contracting mononucleosis, it seems as though the debate will go on. While Sarah Palin remains cloistered, Peggy Hill weighs in on why the debate must be canceled. Reason 10: There’s only 83 days left before Christmas and Sarah hasn’t bought a thing. Reason 9: A screw falls out of Sarah’s glasses and she can’t read her notes. Reason 8: Sarah develops an affair of the heart with Joe Biden and Todd won’t let her go to the debate unless he can stand next to her. Reason 7: Sarah’s family isn’t the kind to let her get on a plane with a passport and a backpack and go into a debate she can’t win. Reason 6: John McCain freaks out and sends Sarah to Capitol Hill to solve the Wall Street Crisis. Reason 5: Sarah needs to stay home and look up those numbers she promised to Katie Couric. Reason 4: It’s a snow day. Reason 3: The witchcraft is getting stronger and Sarah needs a booster blessing from Pastor Muthee before she can debate. Reason 2: Sarah reverses course and agrees to cooperate with the Alaska legislature’s Troopergate investigation and must fly to Alaska at once to answer a subpoena. Reason 1: Excessive time in the tanning bed. Do you have any other guesses? What Would Peggy Hill Say About the Obama-McCain Debate? I think John McCain will want to stay out of automobiles for a while. Sarah Palin is not available for comment. McCain needed to assert his superiority on foreign affairs and on this point he did not succeed. Repeating ad nauseum that Obama “doesn’t understand” does not make for foreign policy superiority. At some point it sounds like whining. Obama pushed back effectively regarding his desire to meet with non-allied foreign heads of state. Obama got McCain to blink on this point by getting McCain to concede that Obama would precede any head of state meeting with lower level diplomatic contacts. And when it gets to the level of parsing Henry Kissinger’s words, then it doesn’t make McCain look good. I don’t think McCain’s tactic of listing names of places he has visited is an effective show of foreign policy experience. Or if it is, then what must he think of Sarah “I got my passport last year. My parents aren’t the kind of send me off with a backpack and a passport after high school. I learn from books.” Palin. McCain certainly generated a lot of bad feelings in the audience by trying to postpone the debate then announcing the day of the debate that he would show. I don’t get a sense that he won them over. If Obama were a petty person, he would have ZINGED McCain when McCain repeatedly stated that he was not the “Miss. Congeniality” of the Senate. If only we could have at that moment interspersed video of Sarah Palin in the Miss. Wasilla competition. A girl’s allowed to dream. Bracelets. Okay, McCain has one and Obama has one. I’m certain they both have drawerfuls of them. The point was well expressed that some mothers want to carry on the war to victory and others want to never see another mother go through what they did. It’s called America is of many minds regarding the wars we are fighting in Iraq and Afghanistan. Iraq. We finally remembered that we’re close to spending a trillion dollars there and Afghanistan is crumbling. Unlike Sarah Palin, I don’t believe that McCain’s willing to say that we are victorious in Iraq. But John McCain’s support for war in Iraq has reemerged in the same room where we are simultaneously discussion a potential US government bailout of Wall Street that may cost us $700 billion. On the “looks” and “sounds” department I think Obama won. It’s difficult to sound presidential when you are such a difficult guest to schedule. And regardless of the $5,000 makeup session, John McCain is still a 72-year old man who has survived multiple bouts of melanoma and who refuses to release his medical records from the last eight years. This thought is reinforced in my mind whenever he talks about his many years of “experience”. It’s unfortunate, but it’s true. Obama does not come across as someone who just fell off the turnip truck. McCain carped about how much Obama “doesn’t understand” while Obama refuted and then asserted. It was, to borrow a phrase from Obama during the debate, a vision of McCain swinging a hatchet and Obama wielding a scalpel. No knock outs, no gaffes. Slight edge to Obama. What Do Sarah Palin and Peggy Hill Think Now? Doesn’t it feel like just yesterday that Sarah Palin hit the national stage? Before all the revelations regarding her witch-hunting Pastor Muthee, Katie Couric interviews, National Enquirer exposes, hiding from the media, five colleges in six years, Troopergate non-cooperation, and tanning bed. Over the past month I’ve come to the conclusion that Peggy Hill and Sarah Palin are linked by verbiage. However, on further reflection I believe that Peggy Hill has greater personal insight than Sarah Palin. I think the following quotes bear this out. PEGGY HILL: I am in over my head. What made me think that I could teach high school? I so wanted to be like “Welcome Back, Kotter.” Now I’m like the real Gabe Kaplan. I am a loser. Sarah Palin and Peggy Hill Are Not Scared of the Economy. I Think. But it’s not always easy to know what either is saying when commenting about the economy. And Sarah’s not being crystal clear when discussing President Bush’s $700 billion proposal to shore up Wall Street. But in Sarah’s mind it has to do with health care, fear, jobs, and all of us feeling sick. And if we don’t act we’ll end up in a Depression (or that’s at least what she said earlier). Maybe she meant we’d all get depressed? 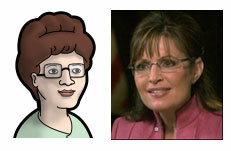 I stand by my position that Sarah Palin is now channeling Peggy Hill. Speaker: That’s basically what entrepreneurism is. Any questions? Peggy Hill Yes. I find that I am too busy being successful so I have trouble remembering all of my bright ideas. That’s why I keep a folder. Speaker: Uhh… That wasn’t really a question. It was more of a comment. Peggy Hill: Oh, why thank you.